I love wine made from the zinfandel grape. The Californian wine producer Edmeades certainly know how to make wine from it. 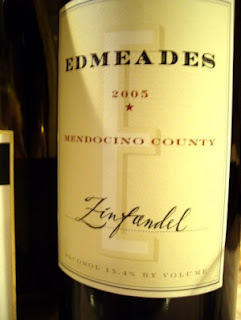 The Edmeades Mendecino County Zinfandel also contains some Petite Syrah (12%) and Grenache (2%) It is a very strong wine, with an alcohol content of 15,5%! This wine has a great variety of aromas from i.e. spices and oak, as well as berries. It was a more complex wine, and certainly is worth its high price, $18,99. It may be enjoyed now, but may also be stored for another five to ten years.